In the recent times there are various interesting options that are easily available when it come to flooring ideas specially kitchen flooring. Painting kitchen floors is one such unique idea which is ingenious, useful and economic at the same time. Painting kitchen floors is a creative and inexpensive way to freshen the kitchen. Painting hardwoods seems the most logical of flooring types, but painting vinyl is also a reasonable step. Kitchen floors can take on any look you want and will look good, as long as you take care to prepare the flooring first, and then seal the painted floors when complete. If you do some research work on how to go about it and follow the simple steps it will definitely turn out to be a striking and attractive piece of work. Painted wood floors will give your kitchen a new lease on life. On the other hand, if you’d like to renew your kitchen flooring then we’ve chosen some of the best options available for you. Complete with buyers guide, reviews, and comparisons! Are you looking for a low cost way to spruce up your kitchen floors? Painting kitchen floors is a great way to give your floors a new look with very little cost. After a long time it is obvious that any type of floor will get damaged. Kitchen is one such room which is generally highly used in most houses. 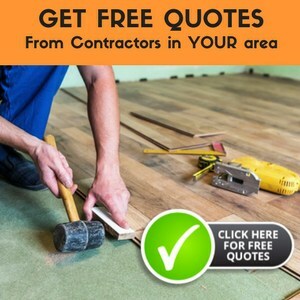 Hence removing the old floor and getting a new one may turn out to be expensive at times. Thus there are budget friendly options too and painting kitchen floors is one such option. You can paint many different flooring materials, including wood and vinyl flooring. All you need to do is prepare them correctly for the paint and you are on your way to having updated floors on a budget. That is really simply and practical isn’t it? If you have hardwood floors that are so damaged that they cannot be refinished, you may want to consider painting them. Painting hardwoods can turn a kitchen that looks old and dinghy into a bright and inviting room that everyone will want to be in. Although there are some people that believe that hardwood flooring should never be painted, many people who embrace the cottage style love the look of painted wood floors. When painting your wood floors, you do not have to use just one paint color. Be adventuresome and use your hardwoods as a blank canvas for your creativity. Think stripes, border, stenciling, or even a painted rug on your floor. Let your imagination run wild. With a little sanding and prep work, you can have beautifully painted floors that your family will love. You can completely change the look of the kitchen with some interesting and innovative ideas of painting kitchen floor and that will certainly add a spark to your home. Vinyl flooring can also be painted. You first need to clean and rinse the floors very well to remove the dirt and debris on them. Prime them with a high quality primer and then paint with the paint you have chosen. Do not be afraid to mix up colors. Create a checkerboard look, use stencils or stamps, or even write sayings on your floor as a border. Your floor is your palette and you are the artist who is creating your masterpiece. After you have finished painting, you need to cover it with at least four coats of polyurethane and then let it dry for the specified time that the manufacturer has directed. Although this is not as durable as painting wood floors is, it can give you time to save up money for a more expensive upgrade. Painted floors are all the rage in country and cottage style design. Both of these designs embrace the look of distressed and old flooring. Many people even distress their painted floors to make them look older and more interesting. Color washing, where you apply watered down paint to the floors and then rub some of the excess off with a cloth, is a great way to mask the blemishes in a floor, but it also lets some of the original character of the floors shine through. If your home is more contemporary or sophisticated in design, you can paint the floors in a more up to date design. Simply color and create your kitchen the way you want it. Using tape to create lines for you to paint different colors can bring color into a room without it being over powering. Use your creativity and look at your home improvement store and on the internet for more ideas for you to create with paint. Do not be afraid to paint your floors. With the proper tools and paint, you will be able to create a floor that expresses your design style and taste. Yes, it can be painted. Strip off the old finish first. You can also fill in the dents and deep scratches if you desire. Where could I find some photos of painted floors to get ideas for a kitchen? Cannot afford new flooring and am planning to paint plywood subfloor after removing linoleum. I have seen a few on-line but would like more pics. Thanks. What should I use as a sealer on a painted floor? Polyurethane – but make sure that it will work with the kind of paint you’ve used. HI, can I paint plywood kitchen floor? thank you. Yes, you can, and be sure to seal with polyurethane. Make sure the poly is compatible with the paint you use too. That is so cool Lisa! If you can upload them to a free photo hosting service you can create links that others can click on to view the pics. Great job! I’m buying a fixer-upper. Having been built in 1939, the kitchen linoleum is terrible, worn and even bare in some spots. I wood like to paint the floors assuming (I have yet to move into the house) that there are wood floors underneath. If there are wood floors, how do I get rid of the material (glue or cement) adhering the linoleum in order to paint the floor?? This subject has been covered many times throughout the site. Hopefully it’s an adhesive and not cement. Use the search engine, located at the top right-hand corner of the page and use the words adhesive removal – you’ll get lots of information. Good luck! Preparing your floors is extremely important when choosing to paint or stain them. The old treatment must be removed or made ready to accept paint. For your wood floor you will need to make sure the old varnish or wax is removed. For stubborn spots, you may need to scrape and sand the areas, making sure to sand with the grain of the wood. For safety sake, use a dust mask and safety glasses before sanding to avoid dust inhalation. After you’ve swept the area and wiped with a damp towel or mop, take the time to pound in the nails, if you have any, and fill the gouges with a wood filler. Finally, clean the floor with a non-wax liquid floor cleaner and allow the floor to dry. I would also suggest a primer coat if you go with the paint rather than the stain. Diamond Coat Varathane Polyurethane a very good product. Whew, it seems like a big effort but when all is said and done it will be worth it! Susan, another thing you could consider if you want to keep the look of the oak floors — grain, etc — then consider putting black paint in a water-based polyurethane. I haven’t done this in black but I have done it with white to give a pickled look to wood. It’s a great way to modernize at a low cost.